This morning we were up at the crack of dawn again, and picked up by a nearly empty minibus. Just us and two other girls from Holland. We drove for a total of about 6 hours, taking a couple of pre-scheduled minibus stops along the way. In the town of Chivay we were somewhat dropped off and told to wait for the next minibus to continue our tour(about an hour we waited). This was fine, except we were lead to a tourist trap cafe to spend a rediculous amount of money for horribly awful, greasy food (our lunch was actually included with the next group we met, but we didn’t know at the time). 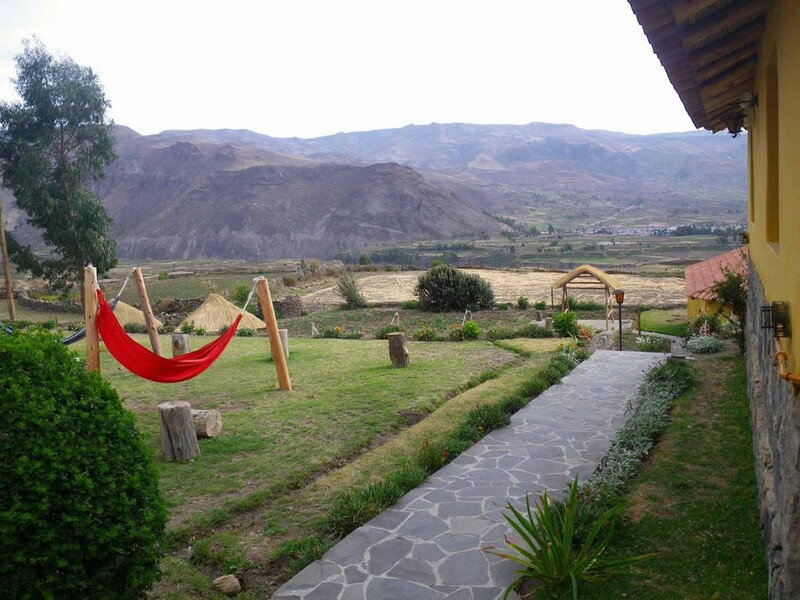 This town is near the Colca Canyon, we we will see that as part of our tour tomorrow, but today we have time to rest in our little cabin-ish hotel room, with a great view of the terraced fields below. I just peaked out the window, just past the hammocks blowing in the wind, to see the local llama rolling in the dust. This place has a bit lower elevation, but as my dad would say its “drier than a popcorn fart”. Even the cacti are dried up and shrivelled, and I know it’s not rainy season, but really. Along our journey today, the landscape turned VERY dry and desert-like. We stopped at the highest point (16,000) to see the volcano’s of the area (from a distance), but the air was really thin and our noses were so stuffy. I guess Everest base camp is about 17,500, but I don’t think I’d want to be any higher than this. 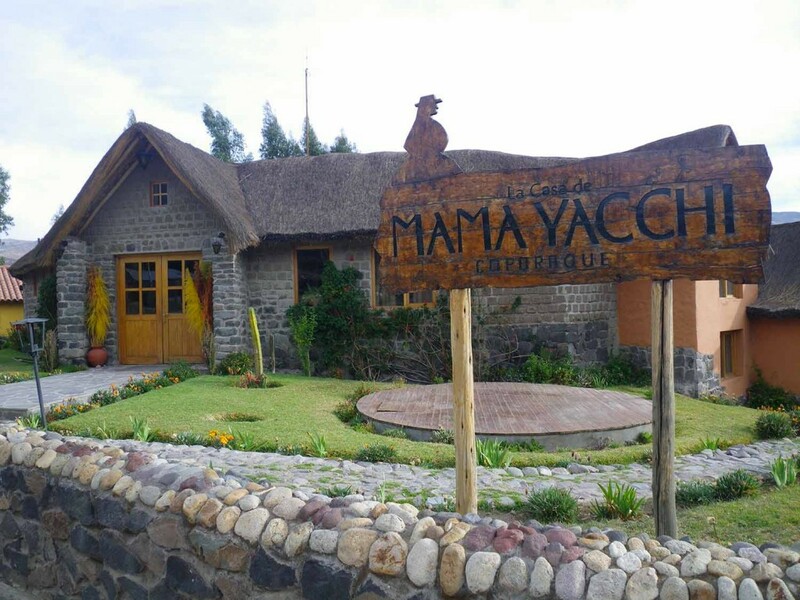 Thankfully our hotel is quite a bit lower than that spot, and I’m not finding it a challenge to breathe at rest as it was sometimes in Puno. Last night in Puno, we stayed in the room, and ordered off the roomservice menu. We never made it down to the plaza to wander, but I don’t think we missed much. Josh slept several hours after our tour, andbarely ate much dinner. In fact, I pretty much ate for two; chicken soup, a thick hot chocolate, a Peru version of the club sandwich, a few fries, and a sprite. Quite the meal, I must say. Josh has had a fever for two days now, and so last night we ordered in some Oxygen from the hotel lobby which he happily sucked back for a good hour or two while listening to the hockey game. I think the fever is finally starting to break, after 24 hours of antibiotics, and a LOT of sleeping, though we’ll never be certain whether it was a stomach bug and the antibiotics are kicking in, or the altitude that caused this in the first place. Today, we both seem to be sneezing, with runny noses, and less stomach ailments, but we’ll see. Currently, we opted out of a short trek around the place with the group, and had a nap instead. Shortly, we’ll meet our little group and head up to the hot springs for a nice soak. Then, we’re looking forward to a yummy dinner, as lunch looked and smelled lovely. P.S. I am SO not a fan of tours. Thank goodness for independence. Amen.